Would you like to have a unique black or gold icon for your room or user nickname? The black and gold special icons are reserved for the top 5 most gifted rooms and users in every zone. The top gifted rooms in every zone also appear at the top of the video chat room list. Black and gold icons show up in user instant messages, room lists, and contact lists. Please note you must be using one of the newer clients to view the new icons. To get a black or gold user/room icon collect as many virtual gift points as possible. There can be only one user and room with a black icon per zone! Do you have ideas for other colored user icons or nicknames? Please let us know. The actual VG should not be totally changed into number. Let the Flame or Crown be there because they are ‘the things’ the most of users purchasing VG’s want to. 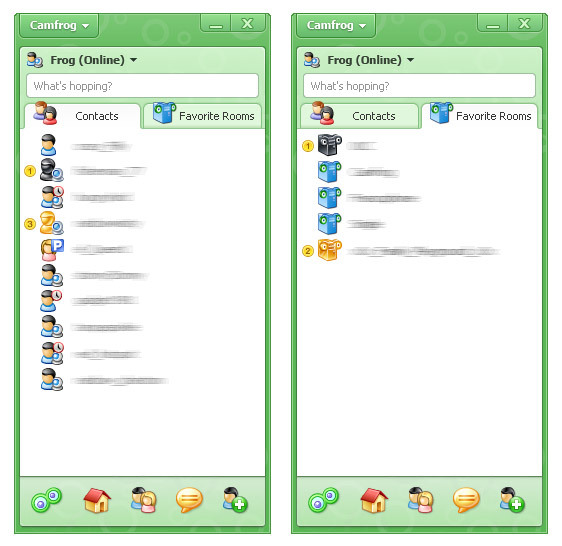 camfrog, i suggest if the special character nicks have the purple & pink color icons for male & female respectively. Secondly, the camfrog officials admin, moderator, proofreaders have a unique icons. Thanks. TO ALL MY FELLOW NUTS-I just realized…We sit and stare at a screen. …CAMFROG is a mental hospital and we are all patients. Feel free to steal this…I just did! Party in my ward! Woo-Hoo!!! Frog, listen the people voice! Your idea on progressing the Camfrog fashion is good, but it’s much better and very urgent that you make a priority of policy. There are thousands users who want to be “citizens of Camfrog state”, but finding this devolution, they get disappointed and step back. Look at the every zones? It seems they lost energy. The only way to restore this poor situation is: Decrease the price of the pro code, and you will find the golden gate of your economy widely opened then! Keep my words! Frog, fix ur system payment in cleverbridge.. more ppl have more problem cant order with her credit card and paypal.. failed.. “payment not authorized”..
check in bank no have problem in CC, more ppl tell same.. and if in cleverbridge problem.. really bad system payment..
so useless if u not fix this..
why u banned my friend ? he had sent an email but no response from you? for what you need new colors ??? bot and servernames …… for what pls ??? you can chat without this all … or … ??? Moderator mode is on. Only operators and friends and colored user Black and Gold user can send chat in this room. I found a glitch on newest latest version.. when I remove the text on cam.. and people tell me that my text still there ever I uncheck it and I look at “Your video” and it is gone but I view myself and it is still there. Please try this if have any more issues or snap shot the promblem send to camfrog help desk so they have better idea whats going on just incase could be your computer having some issues. When you talk to me, a man frog frog camfrog When Are you open? Do you understand me, camfrog __levis_601__ add? how about this idea of users getting loyalty points which can be redeemed for VG. Loyalty points given to users those who login more time helping camfrog for improvements, sort of some games or tournament here in cf and the winners will get cash prize or VG or loyalty points or even camfrog pro. THIS WOULD BRING SOME LIFE IN CAMFROG AND THERE WILL BE SOME MORE THINGS TO DO OTHER THEN JUST CHATTING , IT WILL BE MORE FUN.